Tammy Gomez, Bei Fellow, is among 12 of the city’s influential Latinas whose oral histories have been preserved in a project you can see and hear in March at the Fort Worth Museum of Science and History. “Mujeres Poderosas: The Legacy of Strong Latinas in Fort Worth” combines audio from the histories with photos by Pulitzer Prize winner Beatriz Terrazas. The museum exhibit runs from March 4 through March 31. A reception open to the public will take place from 5:30 to 7:30 p.m. Thursday, March 3, at the museum. Gomez is a poet, playwright and performance artist whose work pushes the boundaries of traditional literature and expression. “My hope is to inspire individuals to have a change of heart, and only art can include the emotional component that moves people,” she said. She does not own a car. 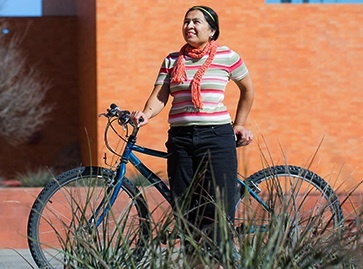 She bicycles to her part-time job at the UNT Health Science Center. She bicycles most places she needs to go. Her groundbreaking play She: Bike/Spoke/Love features actors riding bikes onstage. An homage to the Open Streets movement that advocates bicycle transportation premiered at the Fort Worth Community Arts Center in 2007.